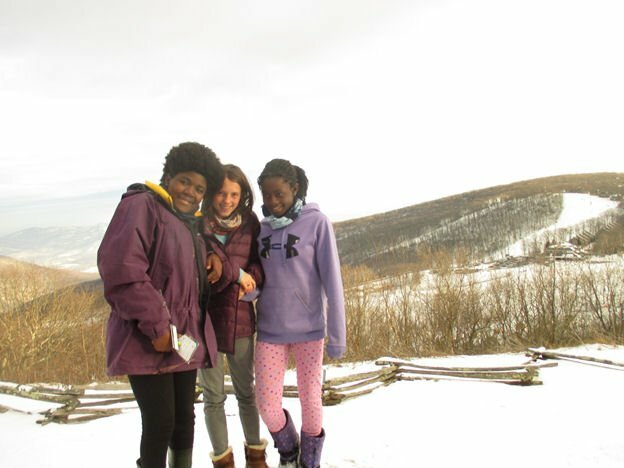 The much hyped storm of last weekend may have disappointed in snow totals, but its effects on area roads made plenty of teachers, children, and skiing families happy with an unexpected pre-MLK Holiday Tuesday. I happily joined the truants for a practice session. 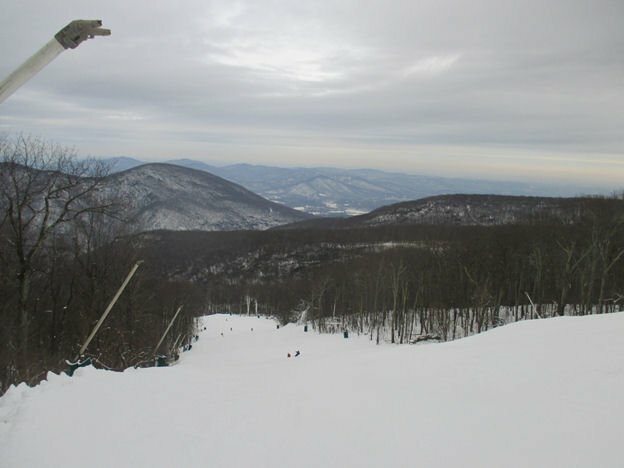 Some of my neighbors have wanted to take their kids and themselves, out for some southeastern skiing (they all have experience in other parts of the country) and with sustained cold temperatures, some natural coverage, and snow days all around the area; Monday was a time to finally expand/localize their perspective. 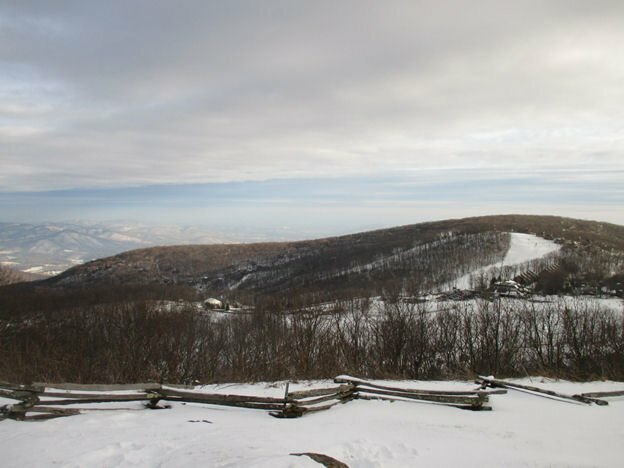 So, we packed up for a day-trip to Wintergreen, with the Blue Ridge of Virginia, for now, a beautiful white. 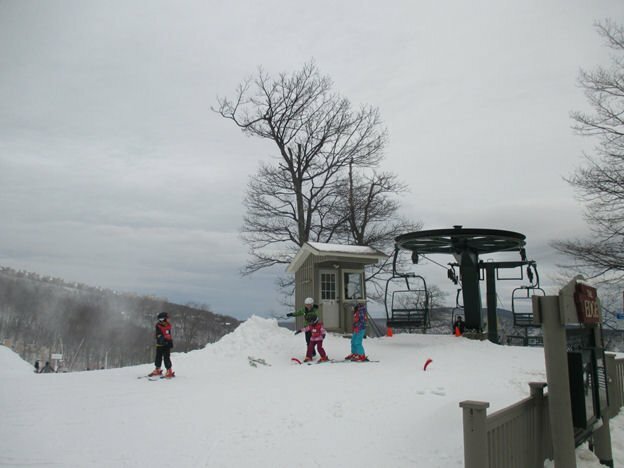 My sons’ took their early lessons at Wintergreen and it is still a great learning mountain. 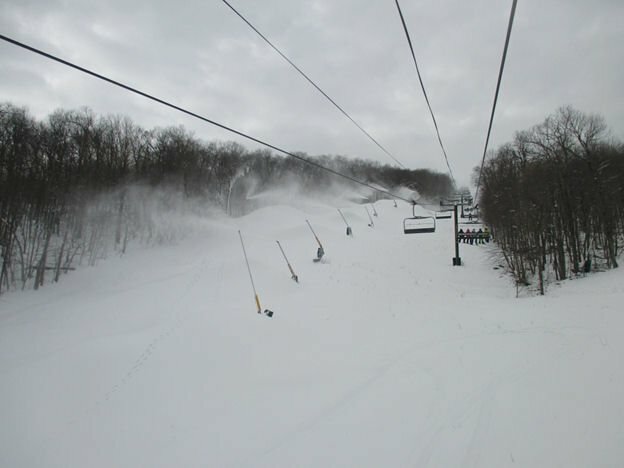 They have an absurd number of good instructors (grizzled old hands and more youthful rosy cheeked types), an efficient check-in and rental procedure, and one of the best beginner lifts to help with that progression that I have ever seen. 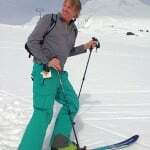 I have also spent some long leg burning days lapping the runs on the Highlands side , a 1000 foot vertical, 4 minute ride to steep terrain with lips and drops and a major bump run when time and temps allow. That was not all in play this time but it was open from top to bottom and the turns were wide and fast with thick loose chalk on the sides. Throughout the mountain there was a sense of marshalling resources, getting ready for the long campaign ahead. Given the warming forecast for the MLK weekend it’s not a strategy of taking hills, but of making them, and some serious stockpiles are in place. Snowmaking efforts have been in high gear throughout our region and the guns were blazing this morning. 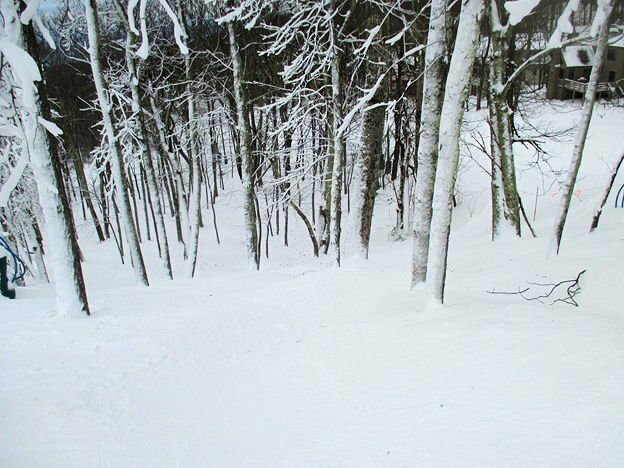 However, Wintergreen does a particularly good job of placing their equipment where you are never trapped in a white-out or skiing face first into a stinging spray. If nearly constant snowmaking operations are the new reality from North Carolina to New Hampshire, then getting the balance right is essential. 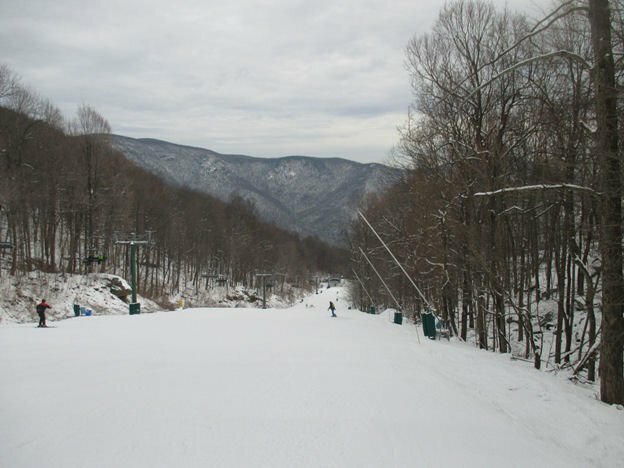 Wintergreen has excelled, clearly they have worked to get the job done but keep the skiing fun. 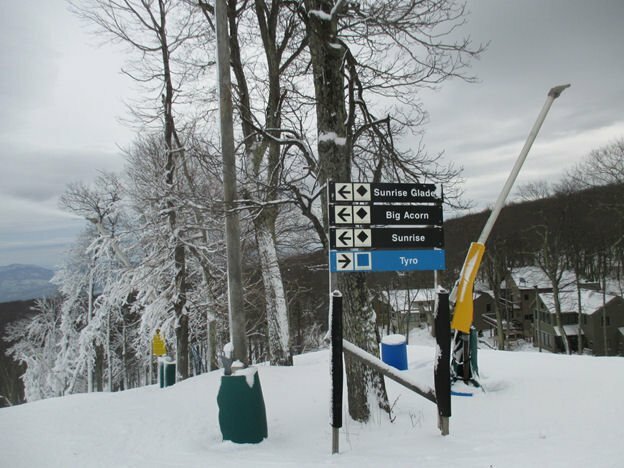 Something new to me was the glade run that has opened on the Big Acorn lift side, beside Sunrise and appropriately named Sun Rise Glades. I told every patroller I saw today: thank you, thank you, thank you, for opening that up. Given the shallow coverage it was undoubtedly a chore, though I suspect they did it for at least partially selfish reasons. Still, enlightened self-interest is a known virtue; so again thanks the more glades the better. 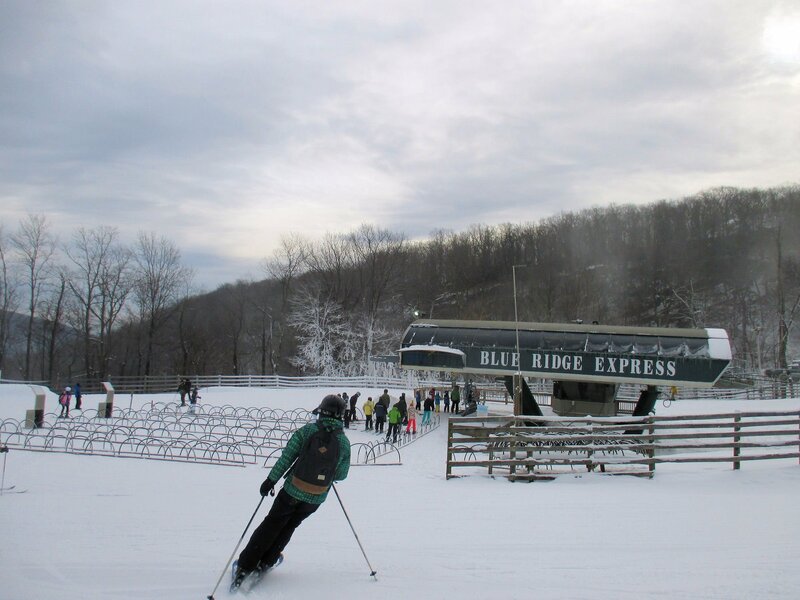 I’m glad Wintergreen is part of the effort to open up tree skiing in the Southeast; it’s a major draw to me. Oh yeah, and another thing Wintergreen has right is some pretty decent scenery — they may not have made it but they certainly positioned themselves perfectly to enjoy it. Those mountains just keep going, and going, and going … makes you want to take a road trip. 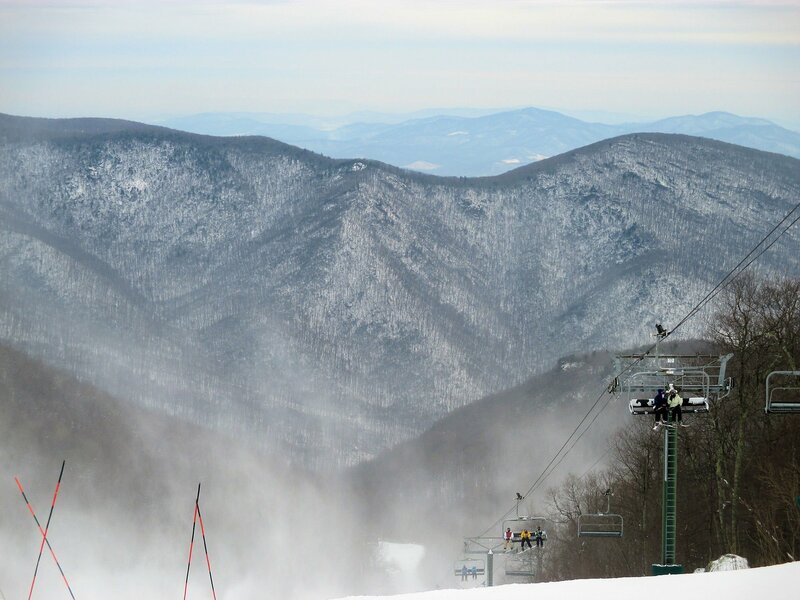 A great day at Wintergreen with some new Southeastern skiers.